Today is a bright sunny Winter day, so it’s easy to see details from inside the window, the truck pulling out of a nearby driveway, the dog tracks and human tracks in the snow on the yard next door, the angles of roof and windows and steps of the house across the street. That house blocks my looking any farther straight ahead, but if I look above it I can see a tall evergreen behind it. I take the time to examine the individual branches, zeroing in on smaller areas without losing the whole. Healthy vision is about seeing the details and interpreting them correctly, easily, without struggle. These details could be on the computer screen in front of you, on the eye chart across the room, on the bird sitting on the branch outside the window, in the clouds way up in the sky, or on your child’s face near you when she wants your attention. People who have worn glasses for a long time, as I did, develop the bad habit of taking in larger and larger gulps of the visual scene at once. As they start to improve their vision and do without their glasses more, they re-learn to focus on details, without losing awareness of the periphery. I’ve joked (better to laugh than cry!) that I probably did everything wrong on the way to improving my vision before I learned to do it right. A good example is looking at details. Intellectually I knew I needed to be better at this, and I hit many roadblocks on the way. First, I wasn’t looking in a relaxed way. Somehow I had gotten the wrong idea that the harder I struggled (at anything, not just vision), the better would be my results. Once I allowed myself to gently look at details in a welcoming way, rather than trying and obsessing about it, I became better at it. And it actually started to become fun! Another difficulty I faced was feeling I needed to rush, that if I didn’t obtain a certain degree of clarity immediately or in a fraction of a second, I was failing. To this day I am constantly reminding myself that I have enough time to see what I need to see. Closely related to the feeling of having to hurry and see everything right now is my overall feeling of anxiety. In learning more about myself and my temperament through improving my vision, I’ve had to admit what a high state of anxiety I’ve been in most of my life. This makes me wonder what might have happened if I’d learned how to be calm as a child instead of getting stronger and stronger glasses. Dealing with what I feel, rather than ignoring my emotions and pressing on to “get the job done” is an ongoing process for me. Daily meditation, exercise, energy medicine techniques like EFT (Emotional Freedom Technique or “tapping”), and of course vision improvement practices, have all helped me to feel more present and calm, and yes, to see better. 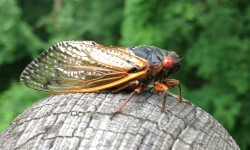 This bug which looks like a space alien is a cicada, who showed up on a branch outside my door 2 years ago. His kind won’t be seen here again for 17 years! Knowing this, I took lots of time to look at him, the contours of his shell and the vivid hues of his markings. Notice the details around you today, appreciating all the visual food your eyes are bringing to you. Every detail is like a different special spice. Savor it! Next Next post: Are You Trying Or Allowing?